Construct a new, two-lane roadway to improve mobility between Rogers Lane, KY 237 (Camp Ernst Road), and Oakbrook Drive. Construct a multi-use path to improve pedestrian and bicycle safety and connectivity. The extension of Holbrook Lane would provide a direct connection from the Oakbrook area to KY 237 and downtown Burlington for vehicles, bicycles and pedestrians. This project would provide a new access point to residential development in the Oakbrook area which would decrease vehicular demand on portions of KY 18 and KY 237. 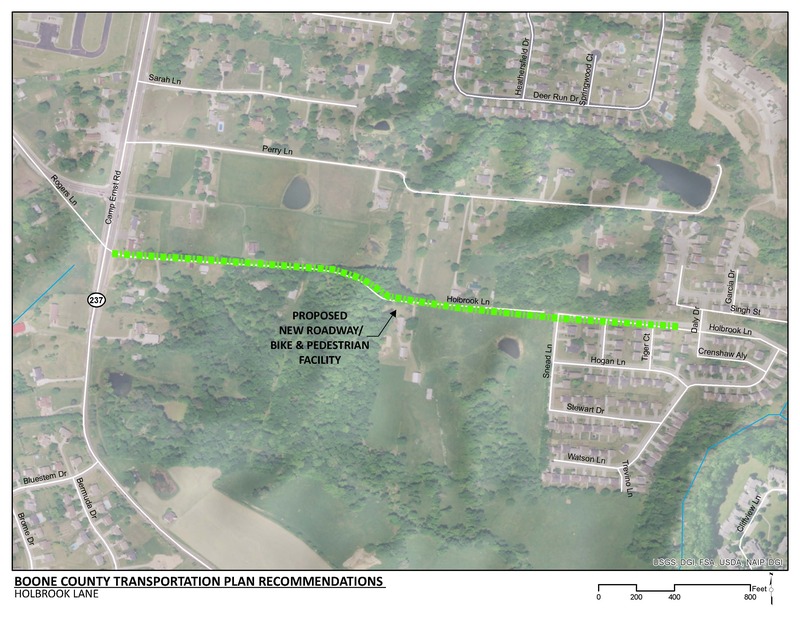 The project would provide a direct pedestrian connection from the Oakbrook area to the Camp Ernst Middle School. This recommendation is consistent with Boone County’s overall goal of improves safety and connectivity. Click HERE for a map of multi-use paths in Boone County. The project will need to be coordinated with the KY 237 widening project as well as adjacent development plans. Existing Holbrook Lane is designated as a private route. The route must be designated as a public facility in order to qualify for state or federal funding. Additional right-of-way will be needed for the project. Existing residential land use extends through central Boone County from KY 842 (Hopeful Church Road) to downtown Burlington. East-west connectivity through this residential area is limited. Residents must use KY 18 (Burlington Pike) and KY 237 (Pleasant Valley Road) for all trips which contributes to the vehicular demand on these roadways. Future residential development is planned within the project area. This development will increase existing traffic volumes on internal routes as well as surrounding arterials and collectors. There is a residential development planned adjacent to Holbrook Lane. There is a TANK Park & Ride located in the shopping center on KY 18 near KY 237. Camp Ernst Middle School is located within a half mile of the project area. Currently, there is no dedicated public bicycle and pedestrian connection from the Oakbrook area to the Camp Ernst Middle School.